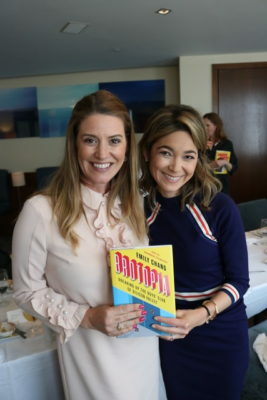 DC’s tech and media leaders gathered just steps from the Capitol at Charlie Palmer Steak on Tuesday, May 22nd to toast the publication of Bloomberg Technology host Emily Chang’s new book, Brotopia: Breaking Up the Boy’s Club of Silicon Valley, on the eve of her nationwide book tour. Emily Chang’s book, which Kirkus Reviews calls “an in-depth analysis of the tech-industry brotherhood,” explores how tech became known as a male-dominated industry. Uber’s Head of Federal Affairs Danielle Burr hosted the lunchtime discussion. Chang applauded the steps certain tech companies have taken to expand on diversity and inclusivity initiatives that seek to bring more women and people of color into tech executive roles. Attending the discussion was Daniel Lippman, Michael LaRosa, Katherine Vargas, Craig Gordon, Juleanna Glover, Meredith Balenske, Jen Stout, Jessica Nigro, Cecilia Kang, Pete Eskew, Heather Childs, Ruth Marcus, Pete Selfridge, Parita Shah, and Patrice Willoughby. Uber executive Amanda Anderson, Rachel Holt, Arathi Mehrotra, and Dave Barmore were also spotted at the gathering.